Congratulations on finding the problem! And I'm glad you didn't harm anything else, yourself included! Thank you! I'm still in disbelief that it was something so simple this entire time. Does anyone have any recomendations on where to order a new toe link bolt? I was contiplating ordering two new bars to replace each side, but since I couldnt find any upgraded options as a replacement, only oem, I'll probably just sand down the surface rust and reuse the ones I have. I'd have never thought to tell you to check for that, and might we'll have overlooked it myself if the car was on MY lift unless you brought it in for an alignment. Glad you found it and that it wasn't worse than it was!! I literally went over every inch of the rear assembly multiple times, and never saw it. And when the car was lifted from the diff, with the suspension unloaded the bar was tight. 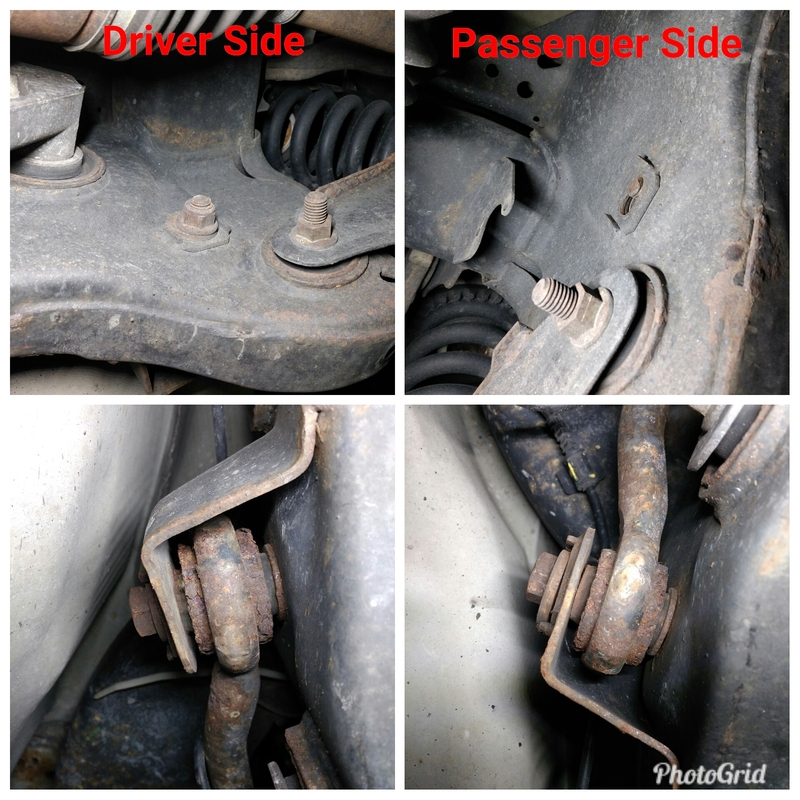 It wasn't until having the car in the air on ramps to keep the suspension under weight that I noticed the play, and then the sheered off bolt. I will point out though, that someone here commented earlier that I should take it to an alignment shop and go from there. I forget who gave that tip, but if I had listened, they surely would have found the bolt when trying to align the rear. So kudos to the member who offered that advice. I'm just stubborn and wanted to find the cause myself before handing over my car to a shop. Real glad you found the issue.and that it was not something huge. If you can't find the bolt on someplace like Rockauto.com, maybe call the dealership. Can't be that expensive. Tried Rockauto first with no luck. But I went on Mopar Part Overstock, and not only did they have the bolt assembly, they had diagrams with every single piece of the suspension assembly broken down so that I could be sure I got the right part. It did cost me $30 after shipping, but at least I know it will be right. All has been fixed. Indeed was just the sheered bolt creating the problem. I installed the new camber bolt, set the alignment to mirror the driver side and tightened up. Car now drives perfectly straight, with zero pull to any side. I appreciate all the help from everyone on here. I’m super glad this one is taken care of.